It won’t be imported, the turf for all 2022 World Cup stadiums will be grown here in Qatar. Aspire Zone Foundation and the Supreme Committee (SCDA) have launched an impressive Research and Development Centre in western Doha. Three hectares of land have been dedicated to various kinds of grass, incidentally creating one of the largest green areas in the sandy Qatari capital. 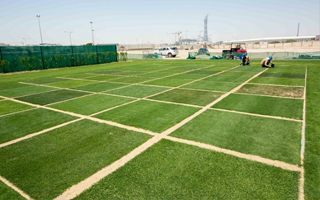 “The best sports turf in the world is grown through good management, knowing what it needs and getting the right nutrient testing done,” said Yasser Al Mulla, SC Manager for Landscape & Sport Turf Management, who is testing approximately 12 different types of grass grown at the facility. Facilities on site have been specially constructed by Aspire Zone Foundation and the SC and include an irrigation trial area, with testing being conducted together with UK-based specialists Sports Turf Research Institute (STRI).